There was a time, between the early nineteen seventies and late nineties, when a decent stereo system was part of every well equipped British home. Whether you were an audiophile or not, owning quality hi-fi equipment was a mark of your discerning nature, like having fine furniture or an upmarket car. By the nineties many the big Japanese names had come up with packaged sets of miniature components to meet this need. 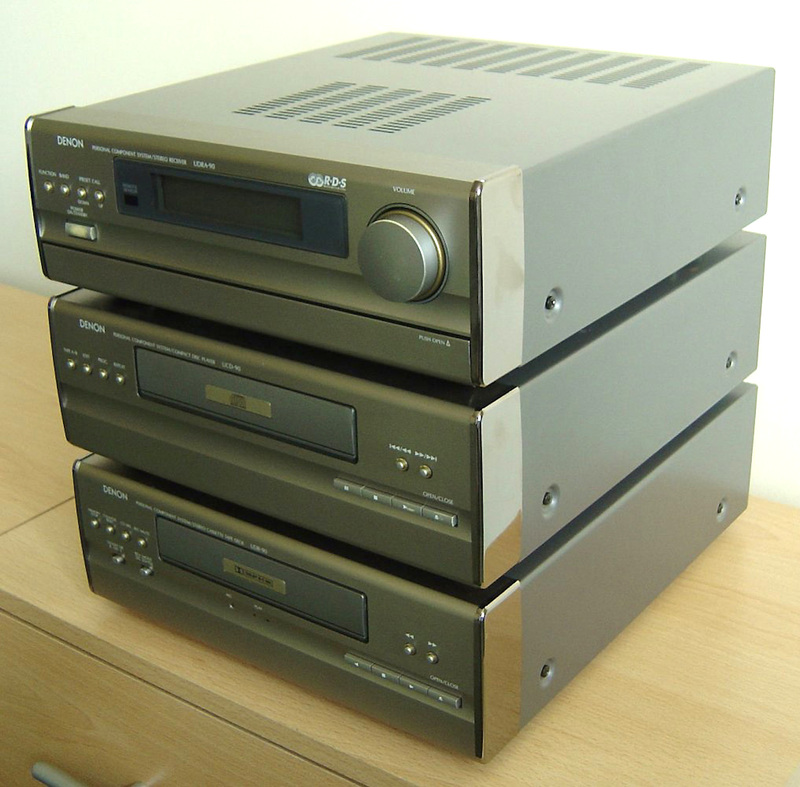 The stacks of shrunken amplifiers, tuners, cassette decks and Compact Disc players looked like proper audiophile gear but sidestepped the usual compromises; the units were attractive and matched in appearance, easy to operate and normally didn’t require a rat’s nest of cables around the back. High-tech features were essential – to be worth considering, any model needed things like remote control, digital tuning, logic controlled tape transports and programmable timers, plus a decent amount of amplifier power. Technics and JVC did well in this sector, but one brand really stood out – Denon. This venerable Japanese manufacturer got the formula just right and benefited from an image that was both recognisable and specialised. For example, you couldn’t buy a Denon television, portable radio or vacuum cleaner, so the public saw anything bearing this name as a serious hi-fi product. The D-90 system seen here is typical of its output, launched in 1993 it comprised an AM/FM receiver rated at 40 watts, a cassette deck and CD player. Neatness of appearance was made possible by the use of Denon’s drawer loading cassette drive, previously seen in its more upmarket separate decks. Using this, the D-90’s cassette and Compact Disc sections were made to look near identical. The display window of the receiver was also made to match this dimension and the overall effect is pleasing; much nineties design has dated badly but this still comes over as attractive and discretely expensive looking. Serious audiophiles may point to the D-90’s somewhat limited power supply and hybrid chip power amplifier, along with the dependency of the two source units on the receiver part (they are both connected by proprietary cables, share the power supply and display and cannot be used with other equipment), and say that this isn’t a proper hi-fi system. The inclusion of a decent MM phono stage and an auxiliary tape loop in the receiver, Dolby C in the cassette deck and dual Burr Brown 18-bit DACs in the CD player counter this point to an extent, but in the end it doesn’t really matter. What counts it that the little Denon looks the part and handles like proper hi-fi. This was by no means a universal thing in this market segment. Many of the D-90’s competitors came burdened with pointless gimmicks which only made them worse. Chief amongst these were various ‘sound shapers’, equalisers, boosters and bass enhancing systems, not all of which could be turned off. These things look good in the showroom but soon make for a tiring sound. Worse, they are often used to disguise problems elsewhere in the design. The Denon has none of this; there are treble and bass controls and a loudness function but the default setting for all these things is ‘off’, when the amplifier gives a flat response. This allows proper hi-fi loudspeakers to be used to great effect. Compared to what the non-audiophile middle classes buy these days, it’s in another league. There is no speaker dock or Bluetooth system that you can buy on the high street that comes close; the Denon has the power and accuracy of a class of equipment which is simply no longer made. All the sources are strong, hardly a surprising thing as Denon are well known for their excellent tuners and cassette decks as well as being the inventor of the PCM encoding system on which the Compact Disc format is based. The amplifier is more than adequate; at normal listening levels there is nothing to complain about and it has enough power reserve for party duties too. Clean, crisp and smooth yet surprisingly detailed, it can quite usefully be partnered with good modern loudspeakers up £500, such as Cambridge Audio’s fine AeroMax 2. These were nicely built units that last well, but now they are getting on for a quarter of a century old there are some overhaul tasks that may now need attending too. The receiver part runs hot so failures in the soldering are not unknown; the area around the power amplifier hybrid chip is particularly vulnerable. The tuner’s memory backup battery may also be exhausted by now, meaning that the preset radio stations disappear if the unit is disconnected from the mains. A heavily used CD player may need a new laser (although it is more durable than many of this era) and the cassette deck will almost certainly need new belts to restore its original performance. Like almost every other slot or drawer loading cassette deck the heads of the D-90’s cassette section cannot be cleaned without taking the unit apart but it isn’t really that hard. The clamping mechanism has to be removed too but this just unclips, it is all carefully thought out so there’s no reason to put up with fuzzy, slurred sound from tapes in this system. Not directly, you’ll need to buy a separate phono stage to go into its line-level aux input. The D90 amplifier has a “phono” output, so “yes” a turntable without a pre-amp can be used. i have this system ,but the volume has to be turned up full to barely get a faint sound..even with headphones..the only way i can use it is to use an external amp ..i would love to know why the volume has gone..??? ?..